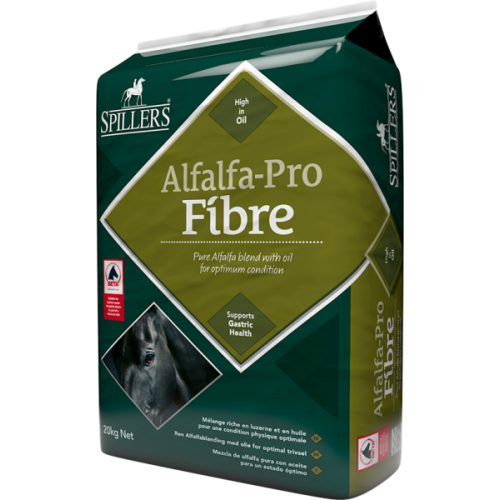 SPILLERS Alfalfa-Pro Fibre contains a blend of fibres including pure alfalfa which is high in quality protein and organic minerals, ideal for feeding alongside compound feeds and balancers. The short chopped fibre extends eating time and combined with the buffering properties of alfalfa helps to maintain gastric health. A blend of slowly, moderately and rapidly fermentable fibres to provide an ideal matrix to support hindgut health. Includes a high level of rapeseed oil to enhance coat shine and provide slow release energy for optimum condition. With added vitamin E, an important antioxidant to balance the high oil content.